This flavorful soup was lovely as our starter on Thanksgiving evening. The crispy apple chips give a nice sweetness, to offset the slightly spicy soup, flavored wit a touch of paprika. The apple crisps are easy to make however take a lot of time in a low oven to dry. Preheat the oven to 100ºC / 210ºF. Cut the apples in quarters and remove the core. Very thinly slice the apples. Lay the apple pieces on a piece of baking parchment or silicone baking sheet and place the sheet in the warm oven for 1 & 1/2 to 2 hours. In a large soup pan, heat the oil, saute the onion and garlic. Add the carrot pieces and spices and allow them to saute for a few minutes. Add the vegetable bouillon and tomato paste and bring to a soft boil. Lower the heat to simmer and cook until the carrots are soft, and the rice os cooked. Puree the soup, and season to taste with salt, pepper and a splash of lemon juice. 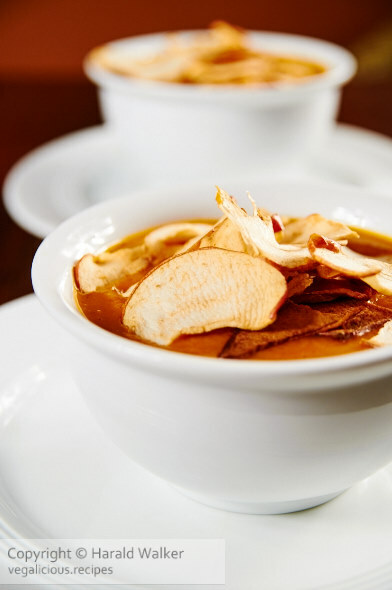 Serve the soup with the apple chips floating on top. Posted by Chris Walker on December 8, 2008 in Apple, Carrot, Soups.